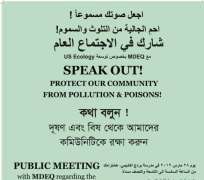 The American Human Rights Council (AHRC-USA) calls upon residents of the cities of Hamtramck and Detroit and all concerned citizens to join the MEDQ public hearing that will be held today, Thursday, March 28, 2019 from 6:00 p.m. to 9:30 p.m. regarding the expansion of the US Ecology Hazardous Waste Facility in Detroit. The MEDQ public meeting will be held at the Bridge Academy located at 9600 Buffalo Street in Hamtramck. Doors will open at 6:00 p.m., followed by MDEQ information session at 6:45 p.m. then the opening of the official public comment at 7:30p.m. The American Human Rights Council (AHRC-USA) and its Coalition members urge the public to attend and to speak out against the radioactive storage and processing in Detroit neighborhoods. AHRC affirms that, time is due for the MDEQ and all related State of Michigan agencies and elected officials to hear the public concerns and help protect the communities from the ongoing pollution and poisons. Clean water is a human right and is not optional.